The usual Syrah suspects are all there: white pepper, red fruit and black raspberry, licorice, and a hint of something meaty and definitely non-vegan. Weighty and generous on the palate, with black raspberry fruit riding on a train of fine tannin and moderate acidity interplay. Probably at best 2018-2026, but who are we to say? Meaty, (beefy, big and bouncy?) foods seem appropriate, but it is important to point out that Rob’s sister pairs BP Syrah with weighty, savoury vegan cuisine and has proved that you can happily skip the trip to the butcher shop. And the wine’s acidity makes it more delicate than you might think, so feel free to lighten up. 97% Syrah, 3% Viognier, all sourced from our Queenston Road vineyard. Viognier skins co-fermented with Syrah in tank and 1-tonne bins. 20 months in French and Hungarian oak. 10 barrels and a justified-and-ancient demi-muid were chosen for the final blend. Bottled August 10 2017. 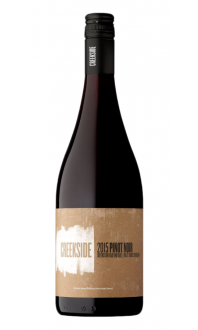 Broken Press is one of Creekside’s most revered bottlings. Because of that reputation, we are very protective of our flagship product line, and aren’t afraid to declassify and skip a vintage if the wine doesn’t have the stuffng. 2015 was a recovery year in the vineyards after a harsh winter that came cold on the heels of 2014’s “arctic vortex” debacle. Once again guilty of gross underestimation of the potential of that site in St. David’s. Try the 2015 now with some breathing time, but please make sure you also lay down a bottle or 12, ‘cause this baby needs some sleep. "Meaty, peppery, dark fruit-flavoured, and tar, cold smoke, violet and fresh coffee ground-inflected, this is textbook cool climate syrah from a warm and generous 2015 Niagara vintage. This should turn wonderfully savoury and umami-driven in time, as the touch of soy and oyster sauce flavours already indicate. The palate is well balanced, full bodied yet with a moderate 13% alcohol declared, and firm acids over moderately grippy tannins. I'd revisit this in 2-4 years for the maximum expression, or hold into the mid-twenties without a stretch. Tasted November 2017."